This city was the starting point of the famous Silk Road during the Eastern Han Dynasty (25-220). Luoyang is one of China's seven ancient capital cities and is noted for its places of historical interest such as the Museum, White Horse Temple, the Shaolin Monastery and Longmen Caves, all of which are included in our specially devised private package. Peony - the national flower of China, emphasises the city's importance, while the Shaolin Martial Arts have inspired people world wide, something that should not be missed during your trip. Luoyang, an ancient capital of thirteen dynasties, is dotted with extensive and profound cultural and religious relics. 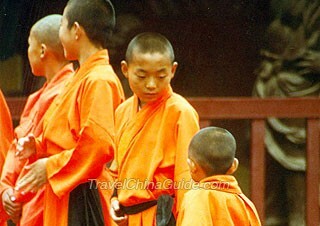 The Shaolin Monastery is the origin of the world famous Shaolin Kungfu. 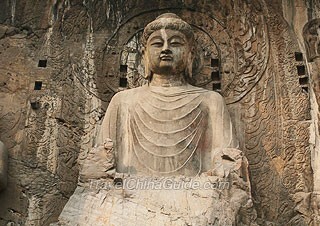 Longmen Buddhist Caves is a landmark in the history of China's grotto art. Both of them along with many other attractions form the unfailing charm of the city. Take a comfortable ride to Dengfeng and immerse yourself in Buddhist culture in the Shaolin Temple. Explore the extensive Pagoda Forest and watch the spectacular Shaolin Kung Fu show. Finally, to complete this Luoyang day tour, take a tour around the Longmen Grottoes - a world cultural heritage site. This Luoyang classic day tour will take you to Longmen Grottoes to view the fascinating natural landscape as well as Buddhist rock carvings and stone tablets. Besides, you can also view the well-decorated White Horse Temple and stroll along the bustling Old Street. 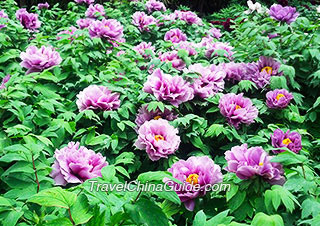 Besides historical relics, Luoyang is also famous for gorgeous peonies, also known as the 'queen of flowers'. If you travel to the city during April, it is highly recommended that you attend the Peony Culture Festival in addition to appreciating the stone carving arts at the Longmen Grottoes. In this 3 days boutique trip, you will pay a visit to the majestic Longmen Grottoes in Luoyang; have a nice glimpse of the Shaolin Temple in Zhengzhou and learn authentic Shaolin Kung Fu. 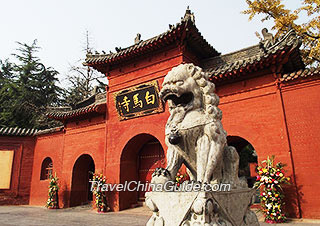 You will also see the magnificent Dragon Pavilion and palatial Shanshan’gan Guild Hall in Kaifeng. For more related tours, please click Hiking Adventure. Longmen Caves - one of three major cave systems in China. These grandiose caves filled with immense Buddhas are wealth created by the ancient Chinese. The grottoes were densely carved on the cliff of two mountains: Xiangshan and Longmenshan. Valuable relics, like niches, inscriptions, stupas, and sculptures are richly housed here. Longmen Caves was listed in the UNESCO World Heritage in November 2000. Shaolin Temple - Situated in the Song Mountain, about 12 kilometers from the west of Dengfeng City, it is the most reputable and longest standing temple in China. The temple is the ancestor court of Zen and the birthplace of the Shaolin Kung Fu that has become the treasures of Chinese martial arts after perfecting from generation to generation. Now the Shaolin Temple has become the only tourist destination for Zen and Martial Arts training. 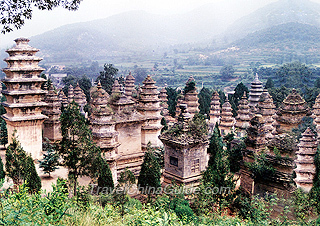 The main scenic spots in the temple are the Hall of Heavenly Kings, the Grand Hall, the Sutra Depository, Hall of Thousands of Buddha and the Pagoda Forest. White Horse Temple - Known as the first temple of Chinese Buddhism, its history can be dated back to 1900 years ago. In 64 AD, the Emperor Mingdi of the Eastern Han Dynasty dispatched envoys to the Western Regions to make a courtesy call for Buddhism. Three years later, the envoys and two great Indian monks returned with scriptures and Buddha statues which were carried back by white horses. In the next year, the emperor ordered to build a temple in Luoyang and named White Horse Temple to enshrine the services of the white horses. Hello can someone tell me if the bus from the Zhengzhou airport to Luoyang is currently operating? If so, what time is the last bus and where do I go to catch it? Thank you so much in advance! Yes, the bus is still operating. The last bus departs at 23:00 and you will find the bus in the second floor. Ask the airport staff or follow the signs to find the buses. There is direct bus from Luoyang Jinyuan Bus Station to Yuntaishan. The bus departs at 9:20 in the morning and returns at 15:00. The bus fare is CNY51.5 per person. As there is only one bus available, you are suggested to reserve the tickets in advance. Alternatively, you may take bus or train to Jiaozuo first and then take a bus to Yuntaishan. Yes, but I would suggest you reserve the tickets as early as possible, especially if you travel on holidays or weekends. What time of day is best to visit the Longman Caves?? How long do you think we will want to spend there? If it won't take all day, which of the other nearby sites would you recommend we visit and how easy would it be to get there? Thanks. It needs at least half day to visit the Longmen Caves. The suggested visiting time of the whole site including the Xiangshan Temple and Bai Garden is 5-6 hours. You may consider visting it in the morning to avoid the crowds and the heat in the afternoon, especially in summer. Besides the Longmen Caves, you can spend the rest of the time visiting the White Horse Temple or the Chariot and Horse Pits. They are in Luoyang, you can just take a taxi to each place. Longmen Grotoes and White horse temple in one day from Xi'an North station. We plan to leave Xi'an North By HSR G train around 9 am and return by 6 pm G train to Xi'an North. Longmen Grottoes is not far from the Luoyang Longmen Railway Station. You can either take bus no. K71 and get off at Longmen Grottoes Station or take a taxi directly to the place. The taxi fare is around CNY15. The suggested visiting time is about 3-4 hours. After that, take bus no. 60 to GuanLin Market and then change to bus no. K56 and get off at Baimasi Station. The taxi costs around CNY60. You are suggested to visit the White Horse Temple for 1 or 2 hours. Then get back to the Longmen Railway Station for your train to Xi'an. Are there any English (or other languages) guides at the Longmen Grottoes? And audioguides? Hi, the English speaking guides and audioguides are available at the Longmen Grottoes.